Emerald (from the Greek word smaragdos, through the French esmeralde, meaning "green gemstone") is a green variety of the mineral beryl and is among the most valuable gemstones in the world. Harder than quartz but softer than diamond, the emerald usually contains many inclusions trapped during its formation. In mineralogy, an "inclusion" is any material trapped within a mineral during its formation. Synthetic emeralds that appear similar to the natural crystals are also being produced. Although the possession of emeralds is indicative of wealth and luxury, we need to bear in mind that these (and other) gemstones were recovered by the hard labor of miners working under difficult circumstances, often placing their lives in danger. The Gachala Emerald, at 858 carats, is one of the largest gem emeralds in the world. It was found in 1967 at the La Vega de San Juan mine in Gachalá, Colombia. It is thought that the elemental constituents of emerald were brought together during such geological processes as orogenesis (mountain building), metamorphism (a solid-state recrystallization of the rock) based on changes in heat, pressure, and the introduction of fluids, and land erosion. Later, crystals of the gemstones were formed. Each natural crystal retains a number of "flaws"—such as crystalline inclusions, bubbles, and fissures—that are a result of the geological processes by which it was formed. Emeralds in antiquity were mined by the people of Egypt, Austria, and northern Pakistan. Today, Colombia leads the world in terms of the number and size of emerald deposits found. In addition, quality emeralds are found in Brazil, Zambia, Zimbabwe, Madagascar, Pakistan, Afghanistan, India, and Russia. A rare type of stone known as a "trapiche emerald" is occasionally found in the mines of Colombia. A trapiche emerald contains rays of dark carbon impurities that produce a six-pointed starlike pattern. It is named for the trapiche, a grinding wheel used to process sugarcane in the region. The mineral beryl consists of beryllium aluminum silicate (Be3Al2(SiO3)6), and the emerald variety is colored green by the presence of traces of chromium or vanadium, and sometimes iron. The color varies in shades of green and bluish green. In addition, emeralds come in a wide spectrum of clarity, along with various numbers of inclusions. The emerald has a hexagonal crystal structure and a hardness of about 7.5 on the 10-point Mohs scale of hardness. This hardness rating decreases, however, with an increase in the number of inclusions in the stone. Most emeralds have many inclusions, and it is rare to find an emerald with only minor inclusions. Consequently, the toughness (resistance to breakage) is generally rated as poor. Most emeralds are oiled as part of the post-lapidary process. The amount of oil entering an emerald microfissure is roughly equivalent to the size of a period in print. 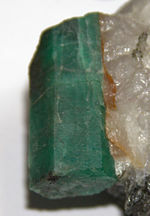 Emerald showing its hexagonal structure. The rarity and value of emerald has provided the incentive for developing synthetic emeralds. Synthetics have been produced by "flux-growth" and "hydrothermal" processes, including a method for producing an emerald overgrowth on colorless beryl. The first commercially successful process for synthetic emeralds was that of Carroll C. Chatham. Stones produced by this process do not contain water but have traces of molybdenum and vanadium, indicating that a lithium vanadate flux process was probably used. Pierre Gilson Sr. has been the other large producer of flux emeralds, which have been on the market since 1964. Gilson's emeralds are usually grown on natural, colorless beryl seeds, which are coated on both sides. Growth occurs at the rate of 1 millimeter (mm) per month, and a typical seven-month growth run produces emerald crystals with a thickness of 7 mm (Nassau, 1980). Hydrothermal synthetic emeralds have been attributed to IG-Farben, Nacken, Chatham, and others, but the first satisfactory commercial product was that of Johann Lechleitner of Inbruck, Austria. These stones, which appeared on the market in the 1960s, were initially sold under the names "Emerita" and "Symeralds" and were grown as a thin layer of emerald on top of natural, colorless beryl stones. Although not much is known about the original process, it is assumed that Lechleitner emeralds were grown in acidic conditions. Later, from 1965 to 1970, the Linde Division of Union Carbide produced completely synthetic emeralds by hydrothermal synthesis. According to their patents (US3,567,642 and US3,567,643), acidic conditions are essential to prevent chromium (the colorant) from precipitating. Typical growth conditions include pressures of 700-1400 bars at temperatures of 500 to 600 °C, with a temperature gradient of 10 to 25 °C. Growth rates as fast as 1/3 mm per day can be attained. Flux-grown synthetic emeralds fluoresce a dull red when examined with long-wave ultraviolet light because of an indicator added during the process of synthesis. Natural specimens, by contrast, do not fluoresce in this manner. A synthetic emerald may be referred to as "created." Its chemical and gemological composition is exactly equivalent to that of its natural counterpart. The Federal Trade Commission (FTC) has strict regulations about what can and cannot be called "synthetic" stone. The FTC states: " [created stone must have] essentially the same optical, physical, and chemical properties as the stone named." 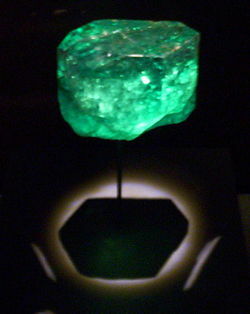 Furthermore, all natural emeralds (except for the red bixbite beryls of Utah, which are anhydrous) have water inclusions, as they are of hydrothermal origin. Likewise, hydrothermally grown synthetic emeralds contain water molecules. On the other hand, flux-grown synthetic emeralds contain no water. For this reason, flux-grown emeralds are more stable when subjected to high temperatures. In addition, wispy, veil-like inclusions are common in flux-grown synthetic emeralds. Emeralds have been highly valued since ancient times. For instance, the Aztecs and Incas of South America considered these gems holy. In addition, the Hindu scriptures known as the Vedas assert that emeralds promise good luck and enhance well-being. The green of the emerald has been taken as symbolic of spring and life itself. It is also a holy color for the Islamic faith. Emerald is regarded as the birthstone for April and May, as well as the traditional gemstone for the astrological sign of Taurus. In some cultures, the emerald is the traditional gift for the 55th wedding anniversary. It is also used as a 20th and 35th wedding anniversary stone. According to Rebbenu Bachya, the Hebrew word "Nofech" in Exodus 28:18 means "Emerald," and was the stone on the Ephod representing the tribe of Judah. According to other commentaries, however, "Nofech" means "garnet," and the "Bareqet," the stone representing the tribe of Levi, is thought to be emerald. ↑ Giuliani, Gaston, et.al. “Oxygen Isotopes and Emerald Trade Routes Since Antiquity.” Science, January 28, 2000, pp. 631-633. ↑ Davidson, Michael W. Emerald Retrieved May 17, 2007. ↑ The Federal Trade Commission, Guide for the Jewelry Industry Retrieved May 17, 2007. ↑ International Colored Gemstone Association, Emerald Retrieved May 17, 2007. Sofianides, Anna S. Gems & Crystals. London: Parkgate Books. 1997. Weinstein, Michael. The World of Jewel Stones. New York: Sheridan House. 1967. This page was last modified on 8 September 2017, at 16:41.